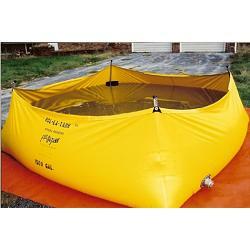 ROL-LA-TANK is the latest in relay storage tanks to provide temporary storage of liquids in remote areas. The light weight tank can be easily assembled by one person in less than 2 minutes. Just unroll the tank, insert the support corners and hook the liner to the top snap clips. ROL-LA-TANK has the advantages of a framed tank with the mobility of a self-supporting tank. The interior or exterior frame design can conform to uneven ground to prevent rolling. The liner is constructed from industrial strength vinyl with aluminum flanges available from 1.5" - 3.0" with male or female threads. Optional forestry quick connects and PVC flanges are also available. Comes with heavy duty storage bag. 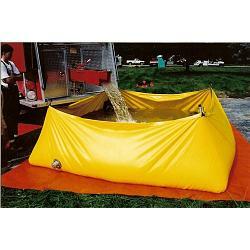 The Rol-La-Tank is also a great resource for oil spill containment and oil spill clean up. Standard liner fabric is 22 oz. PVC available in red, yellow, orange, blue, green or black.